Our transport optimisation and modelling team has access to a range of software which enables us to undertake a wide variety of transport evaluation studies from ‘centre of gravity’ models to optimising depot locations (numbers of, type, and geographical locations) to detailed routing and scheduling studies. We also implement the use of detailed Distribution Planning Systems in order to ensure our transport optimisation and evaluation is as precise, accurate, and effective as possible, which we also employ through our bespoke Cost and Performance Benchmarking services. Transport optimisation ensures that the correct precautions and foresights are taken so that the supply chain can operate as smoothly as possible, both in financial and environmental aspects. Please feel free to peruse some of our case studies below: for a comprehensive list, please visit this page. 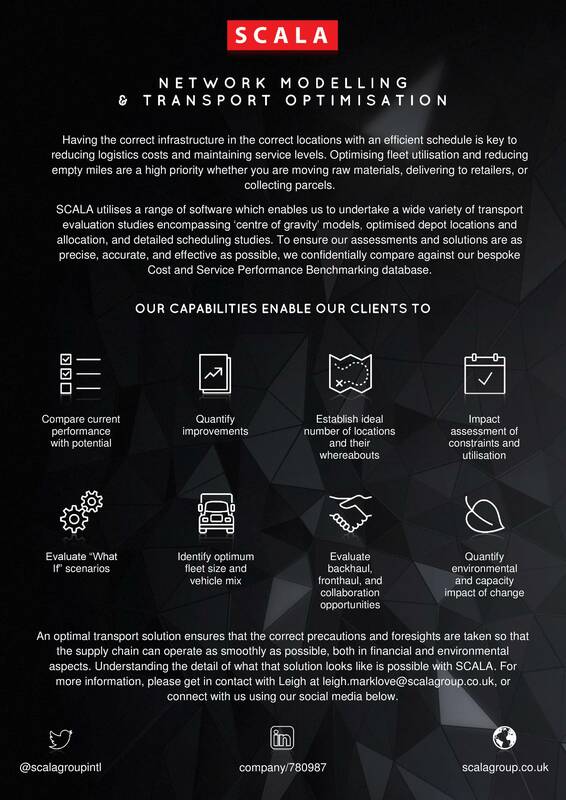 SCALA offers an extensive range of network modelling and transport optimisation services, designed to ensure that your supply chain is operating at its maximum efficiency and economic performance.